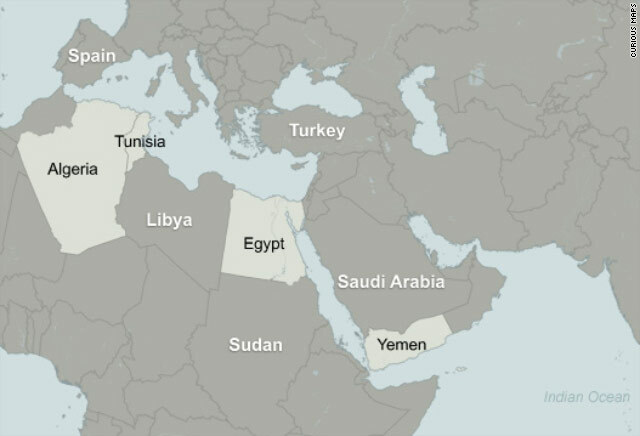 Cairo, Egypt (CNN) -- Apparent fissures in Egypt's regime surfaced Saturday as key members of the embattled ruling party, including President Hosni Mubarak's once heir-apparent son, resigned their party leadership posts and the vice president began talks with opposition leaders. In the strongest gesture yet to satisfy angry Egyptians who have been protesting for 12 days, members of the general secretariat of the ruling National Democratic Party stepped down from those leadership positions, state television reported. The embattled Mubarak, however, remained in his position as head of the party's higher council and as head of state despite popular demands that he relinquish power immediately. Mubarak's son, Gamal, the once presumptive heir, was among those who resigned party posts, meaning that he is no longer eligible to take over after his father. Mubarak has already announced he will not seek re-election in a September vote. Gamal Mubarak's resignation effectively puts to rest a widespread belief that the embattled president was preparing for a dynastic handover. The United States has been mounting pressure on Mubarak to step aside and Saturday, U.S. Secretary of State Hillary Clinton, speaking at a security conference in Germany, said it is "important to follow the transition process announced by the Egyptian government, actually headed by vice president Omar Suleiman." U.S. President Barack Obama, in phone calls with foreign leaders Saturday, emphasized the importance of an "orderly, peaceful transition" to a government that is "responsive to the aspirations of the Egyptian people." The diplomatic official who delivered a message from the Obama administration to Egypt's leadership this week, however, said Mubarak "remains utterly critical in the days ahead as we sort our way toward the future" and must stay in office. Changes are needed in Egypt to pave the way for a smooth transition, and "the president must stay in office in order to steer those changes through," said Frank Wisner, a former ambassador to Egypt. "It's his opportunity to write his own legacy." U.S. officials emphasized that Wisner was speaking for himself, as an expert on the region, and not for the Obama administration. U.S. Vice President Joe Biden spoke with Suleiman by phone Saturday and asked about negotiations he had with several opposition leaders and intellectuals about Egypt's future. "He stressed the need for a concrete reform agenda, a clear timeline, and immediate steps that demonstrate to the public and the opposition that the Egyptian government is committed to reform," according to the White House. Biden also called for the immediate release of journalists and activists who have been detained without cause, the White House said. The restructuring of Egypt's ruling party Saturday included the elevation of Housam Badrawi, a more liberal-minded politician who is taking over as the ruling party's secretary-general. The U.S.-educated physician could add a reformist flavor to the party's direction. Mubarak's foes questioned whether the moves are meaningful or merely cosmetic. Leading opposition figure Mohamed ElBaradei dismissed the resignations as another in a series of small, hiccuping reforms. Mubarak, he said, has shown no sign he understands the people want a complete overhaul. "It's about the whole shift to democracy," said ElBaradei, a Nobel laureate whose National Association for Change wants to see an immediate change in power. "I'm ready to engage when we believe that Mr. Mubarak is ready to step down," he told CNN. "We do not want to be part of a ploy." Demonstrators on the streets also felt Mubarak was just trying to appease the people. One even called the moves a "sedative." "This is just one silly attempt to calm down the street but the regime is still there," said Sameh Bakri in the city of Suez. "They don't want to get straight to the point and resolve the real problem." "This is just part of the drama that the regime is playing, a maneuver, just a sedative to calm down the masses," said Mohammed Mahmoud in the coastal city of Alexandria. "We need a peaceful transition and we know very well what the regime is trying to do. They are trying to buy time, so they can smuggle their money out of the country, the money that they robbed from the Egyptian people all these years." The shakeup was announced almost two weeks into Egypt's tumult as thousands of demonstrators held their ground. 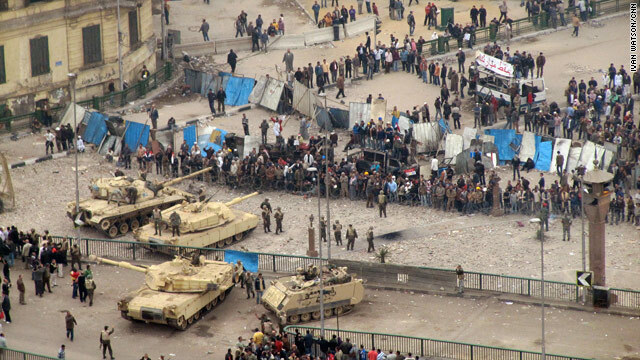 It was was unclear what would happen next and what role Egypt's powerful military would play in resolving the crisis. Among the opposition proposals under discussion is Article 139 of the constitution, which allows for the vice president to assume control if the president is no longer able to serve. At least one opposition group, the leftist Tagammu party, is asking the government to activate the article's powers so that Suleiman can take charge immediately and allow Mubarak to make a graceful exit. Tagammu and the liberal Wafd party met with Suleiman on Saturday, but Wafd party leader Munir Fakhri said the talks are in a stalemate. "As long as the protesters are not ready to lower the level of their demands -- very bluntly their demand is that President Mubarak leaves, quits -- and as long as the regime refuses to take steps towards meeting at least part of those demands I think it's very difficult to reach a compromise." A group of independent elites calling themselves the Committee of the Wise -- intellectuals, artists, diplomats and businessmen -- wants to be at the table during crucial government transition talks. They called on protests to continue at Tahrir Square every Tuesday and Friday until Mubarak "resigns and makes true the demands of the people." Mubarak may remain as a symbolic leader, they said, but should delegate responsibility to Suleiman for the transition period. 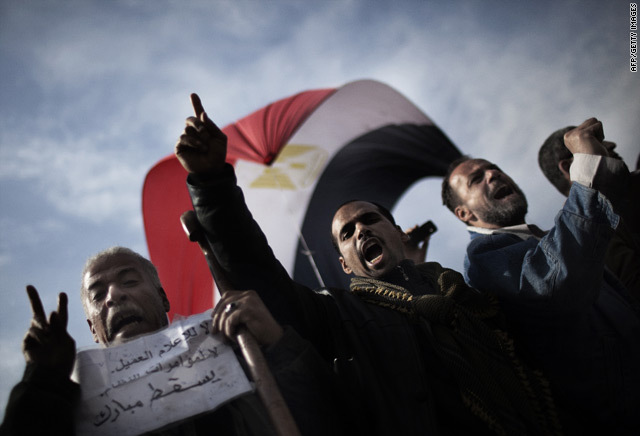 Some opposition groups, however, are refusing to come to the table until Mubarak steps down. "The so-called dialogue is the first step to exhaust this revolution. The president must go," said Mohammed Habib, deputy chairman of the Muslim Brotherhood, an opposition Islamist umbrella group that is officially banned but tolerated in Egypt. Saturday's talks took place as crowds massed again in downtown Cairo's Tahrir Square for protests demanding an end to Mubarak's 30-year authoritarian rule over the Arab world's most populous nation. After chaos and bloodshed earlier in the week, however, Cairo remained calm Saturday, though a heavy military presence persisted on the streets of central Cairo. The justice minister announced that courts would reopen Sunday and the government eased its daily curfew, making the hours 7 p.m. to 6 a.m.
"We're in better shape," Prime Minister Ahmed Shafiq said on state television. "And we can sense that day by day." Interior Ministry spokesman Ismail Othman said the army would remain neutral, working only to prevent clashes and chaos between opposing groups. Meanwhile, ElBaradei's National Association for Change and the Tagammu party's leader announced a newly formed opposition group of 10 people, including ElBaradei, Muslim Brotherhood leader Mohamed Beltagy, and liberal Ghad party leader Ayman Nour. They called for Mubarak's immediate resignation and the right for peaceful demonstration. "We have been in agreement right now that we'd probably have a presidential council of three members including somebody from the army," ElBaradei told CNN. "We have a caretaker government ... who would then run the country for a year, prepare the grounds for the necessary changes in the electoral process to ensure that we will have all what we need for a free and fair election," he said.